While hacking computers and misplaced tablets during the modern-day sequences in Assassin's Creed Rogue, I stumbled on one of the most meta things I've ever seen in an AC game. In an email discussing the possibility of reusing pirate Edward Kenway's memories in another in-universe project, the writer says, "I don't want to give the impression that the studio is just reusing the same genetic memories over and over, so while I want to recycle assets to save money, the experience has to be totally fresh." That's the story of Assassin's Creed Rogue in a digital nutshell, but without the happy ending. After picking up my controller and starting the game, I had to briefly stop and check my system, just to make sure I had the right disc in. I was hit with an immense sense of déjà vu, as if I had seen the locations in the game before, used the same controls, done the same things. After a few hours, I realized I was right: I had already done all of these things, back when they were new and fresh in Assassin's Creed 4: Black Flag. While this isn't an inherent game-killer - and if nothing else means that Rogue boasts strong combat and side-quest variety at its core - a few hours of play reveals that Rogue loses much of what made its predecessor great, and is an ultimately inferior title as a result. A last-gen exclusive title meant to bridge the gap between Assassin's Creed 3 and Black Flag, Rogue follows the tale of ex-Assassin Shay Cormac, who abandons the Brotherhood and takes up arms alongside the Colonial branch of the Templars. While the North American setting is unquestionably closer to Assassin's Creed 3's expansive Frontier, players familiar with Black Flag will recognize where that game's Caribbean environs are reused. Albany, for instance, looks identical to some of the offshoot islands players traversed in Edward's shoes, and the conveniently arranged fallen tree paths of the West Indies return with a force. This reuse isn't limited to settings either, with everything from sound effects and sea shanties to entire animations lifted from Black Flag's chest of tricks. While there's nothing wrong with efficiency, Rogue's recycling of Black Flag is so extreme that it makes exploring the game world boring. Given that breath-taking locales are a well-loved staple of the series (my fascination with beautifully rendered turtles in AC4 quickly wore out the patience of my loved ones), it's unfortunate a year later, repetition means that those breaching whales and well-sung sailors elicit little more than a shrug. Rogue does maintain some of that magic in its few wholly unique settings, like Arctic caves built entirely of ice, and mountain-lined valleys beset by raging blizzards. But these are disappointingly few, and you'll spend most of your time amongst sights and sounds that lost their shine some time ago. The game’s core handling is fine though, as should be expected after so many years of iteration on the same mechanics. Shay is relatively easy to handle, moving seamlessly between attacking, countering and defending with few hiccups. He also has a wide variety of weapons at his disposal for carrying out missions, giving you the ability to engage your target in a tense sword dual, or pop them with a pistol Indiana Jones-style. While you're still required to work within certain limits to achieve full synchronization (‘take no damage' and ‘don't be detected’ are popular examples), they aren't mandatory, and are often worth skipping to try new and creative means of eliminating your enemies. To fill in the blank between AC3 and AC4, Rogue features some of our favorite characters and explains how they're all connected. In doing so, it closes out questions fans have been dying to know the answers to. What happened to the Assassins in North America that made their former mentor Achilles become a hermit? What would Adewale say if he met Edward's Templar son? What wacky shenanigans did Ben Franklin get up to in France and--quick guess--did Arno show up? Rogue finally answers all of these questions, but sometimes the result isn't pretty. Shay can also participate in a vast array of different side quests, which come in every flavor, from citizen-saving to narwhal-stabbing. Here you'll find the near-absurd level of collectibles the series is famous for, as well as brain-teasing fort-infiltrations (taking the form of gang HQ raids) that have made prominent appearances in previous titles. Perhaps most importantly, Rogue features a return of the refined naval combat so beloved in in Assassin's Creed: Black Flag, and it's just as strong here. The fast-firing puckle-gun and oil barrels (which, rather than acting as floating bombs, set the ocean's surface on fire) add an additional twist to the mechanic, and it's easy to while away the hours just taking down riverside forts and engaging in epic sea battles. The game's modern-day storyline adds something else worthwhile, in the form of lore clarification. Playing as the same genetic memory researcher and hacker extraordinaire who starred in Black Flag's modern segments, you can search for notes scattered throughout Abstergo Entertainment headquarters, and in Rogue these touch on lore never before noted in the games. There's a special focus on information covered on the AC Initiates website, which is good, because the info there is as critical to understanding the whole story as it is hard to keep track of in-game. 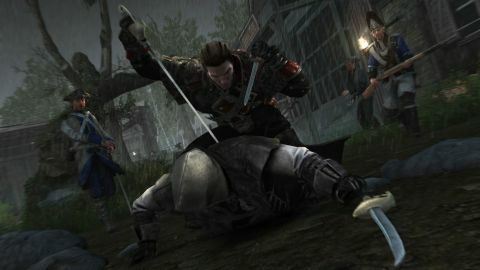 For fans who love the AC games, but don't want to spend hours poring over side material, these bits of data in Rogue are a boon to understanding what the heck is going on in the AC universe... particularly in regard to the re-emerging modern-day Assassins. Since information on the Initiates has popped up in Assassin's Creed Unity, this is undoubtedly the start of a trend, and checking out this info in Rogue is invaluable for those not already in the know. Where the modern-day story delivers in some interesting ways however, the central tale of Shay Cormac falls flat. In theory the story of the Assassin-Templar conflict from the other side - seen through the eyes of a man who has witnessed the Brotherhood's dark side - should be electrifying. Unfortunately, Shay's story is structured in a way that heavily favors MacGuffin-hunting over character development, so there's little honest build-up to the moment he (mild spoiler alert!) betrays his Assassin comrades. The catalyst for his choice is certainly large in scale, but the emotional weight of that decision is never truly explored. This creates a scenario where Shay is willing to backstab his only friends and family after a couple hours of thought - suggesting he's not too beat up about it - which makes it hard to sympathize with him. That sadly doesn't change over the course of the game either; even though Shay mentions feeling guilty, those words don't translate into action or real consideration of what's going on. The rest of the cast fares little better, as Rogue sports a revolving door of characters you barely get to interact with, making it hard to care about any of them. That notably excludes returning characters, but it’s largely due to the fact that we already love them based on previous encounters. Had they appeared exclusively in Rogue, their portrayal wouldn't evoke much emotion. Ultimately, Rogue takes what could have been a heart-wrenching journey of self-discovery and makes it into something lackluster and uninteresting. Given that Assassin's Creed is at its best when it's tearing your heart out through your tear ducts (admit it, you misted up during the prison scene in Black Flag), this situation is a big disappointment. Even on a more superficial level, looking at questions of polish and game length, Rogue ultimately falters. The largely smooth free-running mechanic, for instance, is occasionally upset by Shay's inability to find a climbing handhold until the third attempt in the same spot. He'll also get hooked on two-inch bumps in the earth, or won't be able to start a new mission due to a guard two miles away still looking for him. Add in noticeable typos in the database portion of the game, and it’s sadly apparent that Rogue is missing a layer of finesse, which makes it feel less enjoyable than its predecessor. Perhaps even more egregious is a total length that makes the game feel shrunken. While it's rarely fair to criticize a game for a short run-time alone, Rogue contains half the content of its predecessor - six main mission sequences to Black Flag's 12 of equal length. Given that Rogue borrows so heavily from Black Flag, this disparity in play-time makes Rogue feel more like glorified DLC than a sequel, despite the retail price-tag. Combat and an expansive side-quest system repurposed from Black Flag have a strong showing in Rogue, and the way this installment channels the franchise's intimidating lore will be helpful for fans trying to catch up. However, Rogue is ultimately hobbled by its lacklustre story, short length, and all-pervading sense of been-there-done-that. I'd take Edward over Shay any day. Now if you'll excuse me, I'm going to go play Black Flag again. For real this time. While walking in the shoes of a Templar sounds promising, Assassin's Creed Rogue's dull story, uninspired characters, and largely recycled visuals offer little the franchise hasn't already done better. This game was reviewed on PS3. Description Guide Shay the assassin hunter across the North Atlantic during the Seven Years War.